I am sitting on vacation in Florida on this rainy day and finally finding the time to edit pictures of our last family vacation. 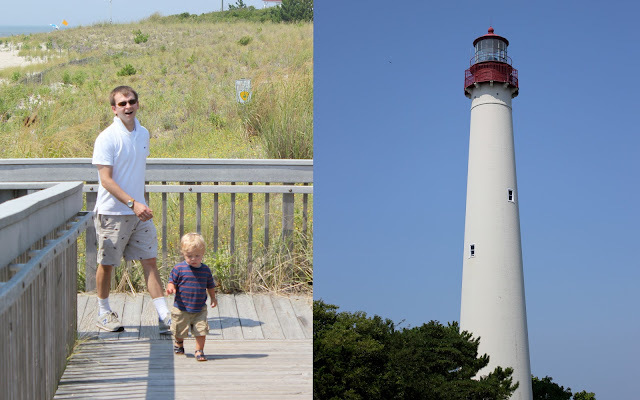 We took the ferry from Lewes to Cape May and spent the day walking around before joining my parents and siblings a few miles up the coast. It was a great long weekend filled with tennis, frisbee, beach, bike rides, golf, and great food. Enjoy the crazy amount of photos in this post! (1) That looks so East Coast/colonial! I want to be there too. (2) Are those peanut butter filled pretzels? We are ADDICTED to those in our house. (3) When did Behr go from baby to little boy? How did that happen? Behr is such a little blonde beach baby! You guys look like you had the best time! cuuuuuutest. love it. shout out to cape maaaaay. oh man! there are soooo many pics here i love! i can't even take it. behr feeding your mom, behr w/ his tong out throwing the ball, behr gives mark kisses, family pics.